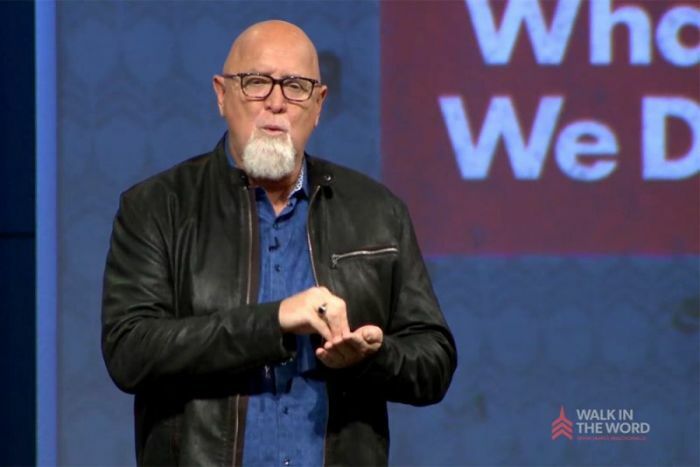 Harvest Bible Chapel's longtime pastor James MacDonald is stepping away from ministry and leadership responsibilities for an "indefinite sabbatical" as the church elders initiate a "peacemaking process" amid recent scrutiny of the Chicago-area megachurch. In an email message sent to HBC members that was posted on the church website Wednesday, the elders said that they had tried to address criticisms coming from outside for the past several years but such efforts have not been adequate as it pertains to their own failures. The Executive Committee of elders privately met Monday which "led to the decision to be part of a peacemaking process that seeks both reconciliation and change where needed." The latest development has come about following an investigative report from Julie Roys, formerly of Moody Radio, in the December issue of World magazine. In the article, Roys detailed how the church, under MacDonald's leadership, had moved around ministry entities in order to redirect funds for suspicious purposes and also reported on an alleged culture of fear and intimidation where MacDonald was allowed to treat people abusively. The church will be partnering with two ministries "that specialize in helping churches resolve issues in God-honoring ways" patterned after Ken Sande's book The Peacemaker: A Biblical Guide to Resolving Personal Conflict, the elders' statement read. The Christian Post reached out to HBC for comment, inquiring further about how this peacemaking process will transpire and was referred to the Wednesday statement. MacDonald, who started HBC over 30 years ago with a group of 18 people, will be taking an "indefinite sabbatical" from preaching and leadership at the Chicago location, the elders explained, and he has recused himself from taking part in the peacemaking process but may preach occasionally at the HBC location in Naples, Florida, through some of the winter months. "I am grieved that people I love have been hurt by me in ways they felt they could not express to me directly and have not been able to resolve. I blame only myself for this and want to devote my entire energy to understanding and addressing these recurring patterns," he said. Prior to publication of the World article, the church sued Roys as well as two former members, along with their wives, who had been blogging critically of MacDonald since 2012 on a site called The Elephant's Debt. The church alleged both Roys and the Elephant's Debt bloggers had broken the law and had spread misinformation about them. HBC ultimately scrapped the lawsuit earlier this month after a judge denied the church two motions in order to keep documents subpoenaed in the case private. Roys responded on her blog Wednesday that she is skeptical about the most recent announcement. "Given all that’s occurred, including a baseless lawsuit for which Harvest has still not apologized, what’s required now is not a 'peacemaking process,' but confession, repentance, and resignations. There can be no true peace without it," Roys said. Roys previously maintained in a separate post that the church not only told lies about her and the Elephant's Debt bloggers but that they knew what they said was false. The Elephant's Debt bloggers, Scott Bryant and Ryan Mahoney, were also not moved by HBC's and MacDonald's latest words. "If MacDoanld’s confession is to be taken seriously — and seen as anything other than an attempt to manage public image — it must be complete and accompanied, at a minimum, by public acts of repentance," they said, referencing a previous blog, an open letter they authored demanding that the pastor apologize publicly and reimburse them for costs they incurred as a result of the lawsuit. "In the absence of that, it is difficult to read this as anything but yet another attempt to spin a story."